The QT-8000CW incorporates the latest in PC technology based on an Intel Celeron 1.2GHz processor allowing peripheral connectivity and demanding software applications. The QT-8000CW’s latest PC architecture provides retail-specific powered interfaces for scanners, scales, POS printers, customer displays, magnetic card readers, etc., via four RS232 ports (one with 5V DC Power), four USB (V2.0) ports, a parallel port and a CF card slot. The QT-8000C supports Windows XP and Windows 2000 professional operating systems. Integrated OS WE-POS pre-installed. Furthermore, a 15-inch touch TFT screen with 1024 x 768 XGA resolutions affords a wider viewing angle for an easier entry operation via the graphical user interface. 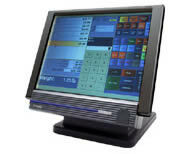 The QT-8000CW unit also has the ability to support “The Extended Windows Display” (2nd Display) and its adjustable mount ensures that operators can easily navigate through the application at the touch of a finger, further reducing time at the Point-of-Sale. A QT-8000CW offers various installation methods for the customer, for example stand type, integrated with table and wall mounting options. A 15-inch TFT touch screen with 1024 x 768 XGA resolution and an IPX1 water splash proof construction helps protect the touch panel from wet hands and water spills. Windows XP, Windows 2000 professional. A Celeron 1.2GHz processor and standard 256MB double data rate memory offer reliable and speedy process for growing businesses as well as flexible I/O ports, RS-232 com ports and USB ports for a variety of peripherals. The standard 256MB memory is upgradeable up to 1GB to meet your business and software needs. Additionally, a built in sound (multi-media) and speaker system for effective sound assistance for the operator and customer is included, along with a high speed 100-base-T Ethernet capability strengthens the communications functions and enhances operating friendliness. This page is part of GeneralManual.Com Network Casio QT-8000CW Point of Sale Cash Register User Manual.